How about this for a holiday cottage? Clomantagh Castle is a collection of buildings which dates from the 12th Century - right up to the early 19th century. This old castle has been restored by the Irish Landmark Trust, and is now a holiday accommodation sleeping 10 people. 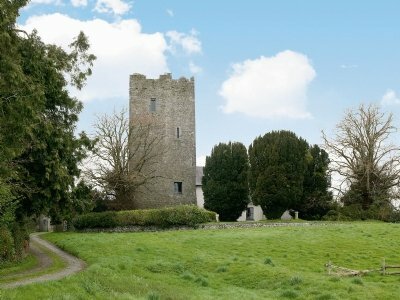 For all you budding kings and queens out there, Clomantagh Castle in County Kilkenny makes a great holiday destination. Clomantagh Castle sleeps 10 people in 5 bedrooms - with the bedrooms being made up of 4 double bedrooms and a twin bedroom. There are 2 bath rooms and a separate shower room. Clomantagh Castle has oil central heating, and an open fire for those cold nights. You get a washing machine and dish washer, and a Waterford Stanley range cooker. A collection of games, books and a radio are provided - but there isn't a TV. Clomantagh Castle has a large garden with an area for sitting and taking in the peace & quiet. Car parking is also available for 3 cars. Holidays at Clomantagh Castle start on a Friday - short breaks are also available at Clomantagh Castle. Around the area you've got the medieval city of Kilkenny 10 miles away. Kilkenny has plenty of medieval landmarks to discover; along with a modern & lively culture and entertainment scene. Further away Dublin and Cork can both be reached in an hour and a half drive from Clomantagh Castle. You can also visit "St. Canice's Cathedral" and "Rothe House", which are both nearby. Or spend your time taking walks in the countryside. Should Clomantagh Castle not be to your liking, but you fancy staying in the area around County Kilkenny, you might well be interested in the cottages below. All these cottages are within a few miles of Clomantagh Castle.